Given the start of MySuper this year, superannuation trustees have released numerous lifecycle funds to satisfy this new legislation. Whilst lifecycle funds have been popular among superannuation trustees, the investment and adviser community haven’t been so complimentary. Either way, lifecycle funds definitely have a place in the investment landscape and they provide an approach to investment that is cognisant of a very simple concept that is often overlooked by some superannuation trustees’ choice of default fund…asset weighted returns. …After thinking about asset-weighted returns and how to apply this thinking throughout the working life of a superannuation member, I did the following little exercise. I know this has probably been done to death by the lifecycle investment gurus out there but I thought I’d see for myself what I would come up with…its not perfect but more than adequate. We start with an 18 year old with no superannuation, earning $20,000pa. Obviously 9% must be contributed to super under Australian law (back in 2011), and we also assume his/her income would grow at 4%pa which is roughly in line with average growth rates in AWOTE (Average Weekly Ordinary Times Earnings…I think). 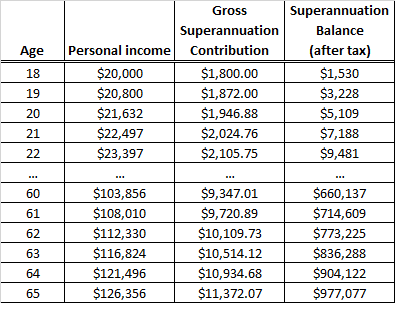 Another assumption is that the superannuation investment would grow at an annual rate of 7%pa after tax, which is obviously well above the risk free rate but over a working life of more than 40 years I’d like to think is achievable for a ‘balanced’ investment across multiple asset classes. Now, obviously in the real world, one’s income and superannuation contributions will fluctuate, and of course investment returns will also fluctuate (don’t I know it!!). But, overall the outcomes from Table 1 don’t look too unreasonable. Step 2 in this exercise is to consider ‘Value at Risk’ or VaR. Whilst VaR is a concept that has been blasted in recent years thanks to its mis-applicaton leading up to the GFC, its still not a bad way of looking at downside risk. Using various risk and return assumptions, across generic portfolios ranging from 0% risky assets to 100% risky assets, we calculate VaR for each portfolio…the definition is that the portfolio has a 1 in 40 chance of returning lower than the VaR result. For example, we assume for a 70% risky asset portfolio it has a 1 in 40 chance of achieving a return worse than -10.5% in any one year and for a 30% risky portfolio a 1 in 40 chance of returning worse than -3.8%…you may think this is a little optimistic but sobeit, its probably not too far off. Using this information and using the outcomes from Table 1 for each year from age 18 to 65, we do not wish to have more than $30,000 at risk (that is a 1 in 40 chance of losing more than $30,000 of superannuation). This is an arbitrary amount that could be anything but for the purposes of this exercise I have randomly chosen $30,000. Now for the quant geeks reading this I know there should be some optimisation techniques with regards to the inputs but in keeping things simple we use the balance figures from Table 1. 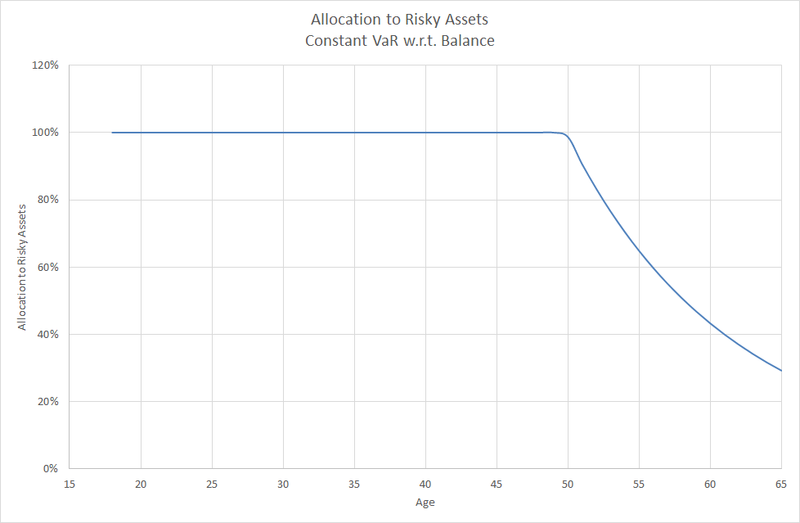 Using the calculated VaR results for each portfolio, Chart 1 shows what the maximum exposure to risky assets needs to be throughout my example’s working life. As can be seen, this chart has a very similar glide path that many of the lifecycle funds have. Maximum exposure to risky assets does not start to decline until around age 50 and at age 65 the maximum exposure to risky assets is around 30%. These outcomes can easily be adjusted on an individual basis depending on risk/return expectations, super contributions, as well as how much super balance one wants to put at risk over time. But these results use my rough estimates. Now we all experience asset weighted returns…i.e. it hurts more when we lose more money…so…bottom line…if we consider asset-weighted returns and minimising downside dollar specific risk as we move towards the latter part of one’s working life, when designing asset allocation for a superannuation member the evidence supports a lifecycle/glidepath approach to investing superannuation. Despite this result, there is nothing necessarily wrong with the “balanced” fund as it may well have the best return per unit risk over long periods of time. However, it is an approach that only considers return per unit risk and ignores the size of the underlying balance. The Srategic Asset Allocaiton approach is largely based on a time-weighted approach to investing versus the asset-weighted approach that is the lifecycle or glidepath approach. Both are valid but they depend upon the desired investment objectives which are clearly different. One final point about MySuper funds (which are funds designed for cohorts) that many overlook….they are almost guaranteed to be inappropriate for the individual investor who is highly likely to have completely different investment objectives…and this is particularly the case for the lifecycle fund just as it may be for the “balanced” fund.